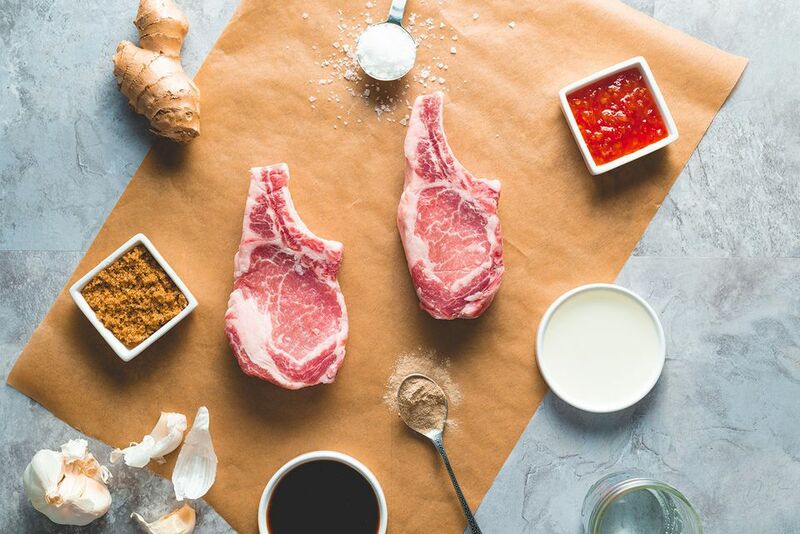 A great marinade for pork, particularly pork chops. The sweetness from the brown sugar and saltiness from the soy sauce marries well with the chili sauce. Combine all ingredients in a small bowl until brown sugar has dissolved. Store marinade in an airtight container in refrigerator until ready to use. Mixture will last for 5-7 days if stored properly. Recipe yields about 3/4 cup or enough for about 4 pork chops. Increase recipe to suit your needs and quantity of pork chops. To marinate: place pork chops into a resealable plastic bag (2 bags if you are preparing more than 4 chops). Pour marinade over top, making sure all surfaces of meat are well coated. Seal bag and place into refrigerator for 4 to 12 hours. Cook as directed. This mixture can also be used as a sauce or baste. Simmer over medium heat in a saucepan for 7 to 8 minutes, stirring often. If you'd like it thicker, increase heat to medium-high, mix together 1 to 2 teaspoons cornstarch with 2 tablespoons warm water until dissolved. Add to mixture and stir in for 1 to 2 minutes until desired thickness is achieved.